Visitors to Burj Khalifa are invited to wear pink, to show their support to the cause. The world's largest LED-illuminated façade on Burj Khalifa is being illuminated in pink every weekend (Thursday, Friday and Saturday) in October as part of a campaign to raise awareness and funds during the annual breast cancer awareness month. 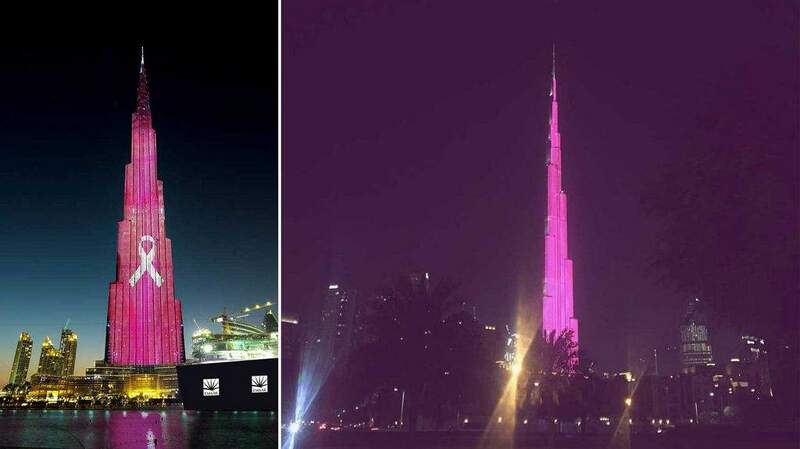 The world’s largest LED-illuminated façade on Burj Khalifa is being illuminated in pink every weekend (Thursday, Friday and Saturday) in October as part of a campaign to raise awareness and funds during the annual breast cancer awareness month. In addition to the pink glow – which will glisten above Dubai’s skyline – themed chocolates will be distributed at The Café located at At the Top, Burj Khalifa; and for every item sold in the At the Top, Burj Khalifa retail stores throughout October, Dh1 will be endorsed to Al Jalila Foundation. Al Jalila Foundation, founded by His Highness Shaikh Mohammed Bin Rashid Al Maktoum, Vice-President and Prime Minister of the UAE, and Ruler of Dubai, is dedicated to transforming lives through early detection of breast cancer, facilitating medical treatment and funding locally-based research into the epidemiology of breast cancer in the UAE.